Some men’s lives can be defined by a single question, and for Clare St. Arnaud, one of America’s top ultra-triathletes, the question is why. Why does he compete in these outrageous endurance races, these dances of pain in which athletes gallop to the breaking point, the last barrier of physical tolerance, then cross it, never knowing what’s on the other side because so few have ever been there? St. Arnaud’s answer is simple: He does it for his people. As an ultra-triathlete, St. Arnaud swims, bikes and runs extraordinary distances. He was one of 20 elite athletes from around the world invited to Canada last summer to compete in a three-day race called the Earth Journey British Columbia Ultra-Distance Triathlon Stage Race. On day one, he swam 5.7 miles in a wind-chopped lake, then peeled off his wetsuit and biked 84 miles, to an altitude of 5,500 feet, in 45-mile-per-hour head winds. Day two was a 173-mile bike ride over three mountain ranges. With three hours of sleep, St. Arnaud got up the third day and ran a 51-mile double marathon. It was the first time an event of that magnitude had been attempted on North American soil. Just finishing was a remarkable feat, and St. Arnaud is 54 years old. St. Arnaud’s life is training. He calls it his work. He lives in a tiny trailer in the shadow of the Catalina Mountains, an American flag flapping in the breeze outside. He sleeps on the floor because he doesn’t want to get too comfortable. When he hears rain pattering on the roof, he laces up his track shoes and heads out for a run. His daily regimen consists of an eight-mile run, followed by a 50-mile bike ride and two hours in the swimming pool. His diet is mostly pasta, rice, tuna, fruit, vegetables, beans and bread. After working out, his appetite is so great he uses chopsticks to keep from eating too fast. St. Arnaud is a blacksmith by profession, and still practices the trade. 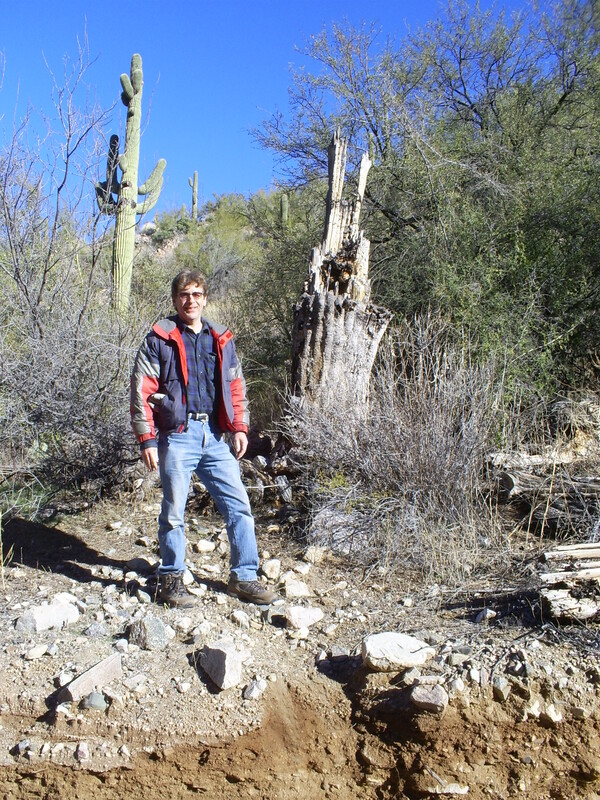 He also is a fitness consultant to Biosphere 2, that futuristic experiment in the desert. Among his responsibilities are counseling the eight men and women sealed inside the special environmental complex on health and fitness. St. Arnaud is a model of fitness himself. He stands 6 feet, 225 pounds. He has a refrigerator for chest, tree-trunk legs, dangerous arms. His black hair is shoulder length, showing the first streaks of gray, and when he competes he wears silver war-shield earrings. In spite of his menacing size, St. Arnaud is soft-spoken, and has a quick sense of humor. At the Earth Journey race in southern British Columbia, as he was slogging up a steep hill, he joked to a reporter that he was going so slow he was afraid an anthropologist might come along, scoop him into a box and ship him to the Smithsonian. St. Arnaud knows that well. Like so many reservation Indians, he turned to drinking and became an alcoholic. In the mid-1970s, as he considered suicide after losing his wife and daughter through divorce, he left South Dakota for his great-grandfather’s ancestral home on the Santee Sioux Reservation in Nebraska. He moved to Arizona to train year around in 1984. His focus now is on racing. Next month he will be one of about 12 athletes competing in Earth Journey Vermont, and ultra-marathon that will take place near Middlebury. Then he might turn his attention to his dream of swimming the English Channel. “I want to be the first Native American to conquer the European continent,” he says. Although St. Arnaud is unknown to the general sporting public, his name is familiar to Indians. They often come up to him, at races and other events, some with tears in their eyes, to say he is the reason they’re alive. Last year, on a hunting trip in South Dakota, a man St. Arnaud remembered as one of the worst drunks on the reservation approached and said he’d quit drinking. He credited St. Arnaud with turning his life around. The man said he used to see St. Arnaud out running and riding his horses in the cold, and had read about him in newspapers, and overheard other Indians discussing him. “It was as if your spirit was always there with me,” the man told him. Out behind his trailer, St. Arnaud has built a sweat lodge. A tobacco leaf hangs from the ceiling for purification. St. Arnaud sits beneath it to sweat and sing, the Great Red Hope asking the Great Spirit to keep giving him the power.